Qian Ri Hong literally translates to "Thousand Days Red" due to the long blooming period of this flower. This tea contains essential vitamins and minerals and is known in Chinese medicine for helping to relieve cough, shortness of breath, and enhance vision. Light herbal sweetness. We recommend two minutes steeping time for this tea. 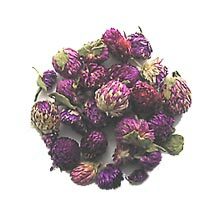 Reddish purple dried Globe Amaranth Flower. The color of the infusion may vary from light pink to reddish purple depending on the infusion time.